Find out everything you need to know to use this growing medium effectively. Curious about coir? 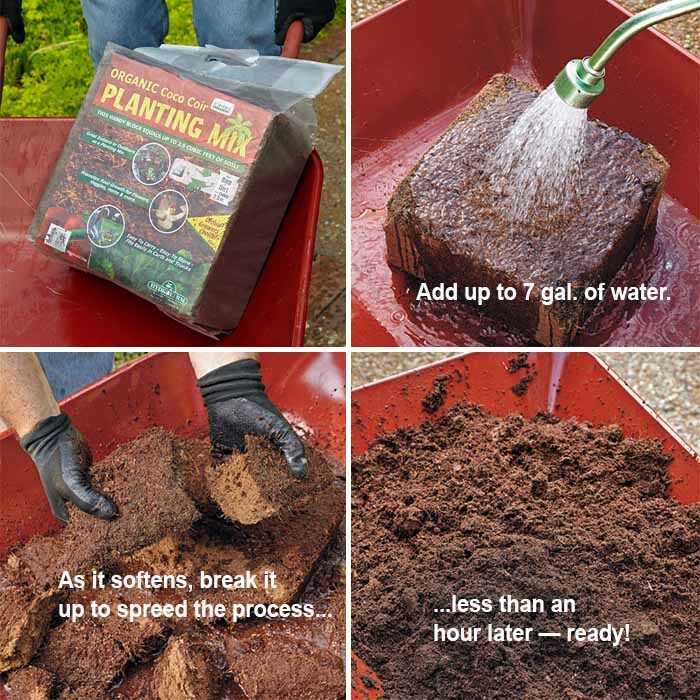 Pronounced “quar,” it’s a quickly renewable growing medium, made of fiber stripped from coconut shells, available at most garden centers as a compressed brick, which we show you how to break down at left. It’s a good substitute for sphagnum peat in homemade potting mix. But never add more than 40 percent. While it absorbs and holds roughly 90 percent of its volume in water, it tends to pack, so air can’t reach roots very easily. But if it dries out, it’s easier to rewet and since it’s close to neutral, you don’t have to add lime to balance an acid pH. You can even use long-fiber coir to line hanging baskets or planters. Do evergreen daylilies need special winter care in your area?